“The series A is essentially dying. 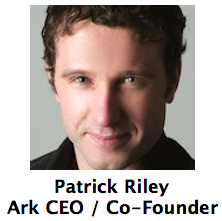 If I can get an amazing valuation at a seed round, not give up a board seat, and keep complete control of the company, why not?” This is Ark co-founder Patrick Riley’s reasoning for why instead of raising a Series A round, his people search engine just locked down a jaw-droppingly massive $4.2 million seed round. Ark will use the money from Andreessen Horowitz, Greylock Partners, SV Angel and more to build out its mobile and search teams, and do a big marketing push when it opens to the public. It seems much of Silicon Valley sees a big opportunity for Ark to capitalize on the people search shortcomings of Facebook and Google. So big that even with less control, Charles River Ventures, Intel Capital, Atlas Venture, Crosslink Capital, Expansion Venture Capital, Felicis Ventures, Lightbank, Transmedia Capital, Salesforce, Tencent, and several angels are also in on the round according to AllThingsD‘s Liz Gannes. The round ranks amongst the largest publicly disclosed seed rounds in Y Combinator history. I was the first to write about Ark’s beta last month, where I detailed how the product lets you layer filters to find out which of your friends are single, who are in your current city and is fluent in a language you want to learn, or who lives somewhere you’re visiting and Likes a band performing there so you could go to the concert together. This is all data scattered across Google+, Twitter, and particularly Facebook. Ark’s search pulls in info from all these sources plus profiles on LinkedIn, Foursquare, Myspace, Orkut, Meetup, Vkontakte, and Ren Ren. By pulling data from across platforms, there’s less chance for Facebook or the others to steamroll Ark. Beyond helping you find people, Ark wants to surface contact info and other important characteristics about your friends without you having to know which network that data’s hosted on. “We’re essentially trying to do the other side of search — the personal search, what Greplin attempted to do to a limited extent.” Mobile apps for tracking down this info are coming this summer. And while there are plenty of startups offering some of what Ark does, none I’ve seen are as clean and straightforward. For example, people set up whole accounts on Classmates.com or schoolFeed just to reconnect with who they went to high school with because Facebook buries that capability so deep within its Find Friends feature. Ark makes it as simple as layering your high school’s name and your graduation year.